I love planning a good theme party. I’m not quite sure whether it’s the cute things you get to create, the endless possibilities you have, or the way your vision all comes together for one special day. 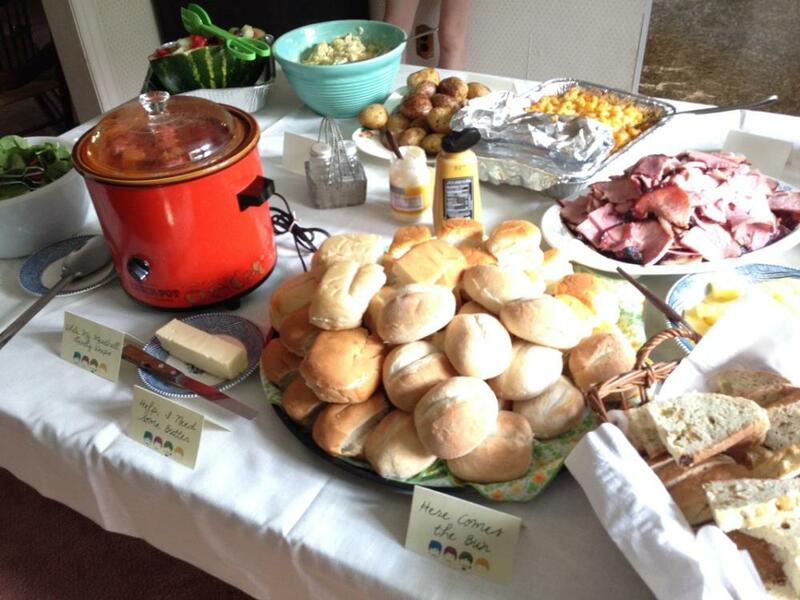 A really great theme party is like having a living Pinterest board. We decided to throw a 64th Beatles party for my dad based on the song “When I’m 64.” He loves the Beatles, and my sisters and I thought it would be a pretty cool theme to work with. 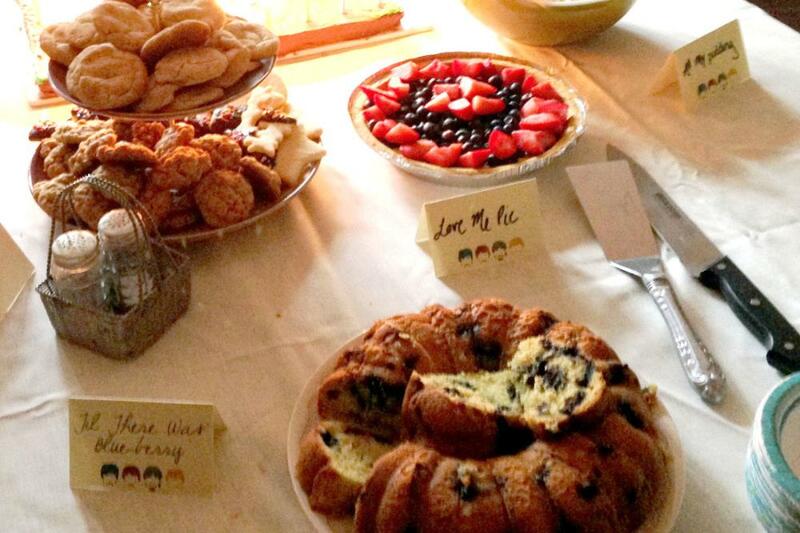 We loved coming up with all of these DIY Beatles party ideas. 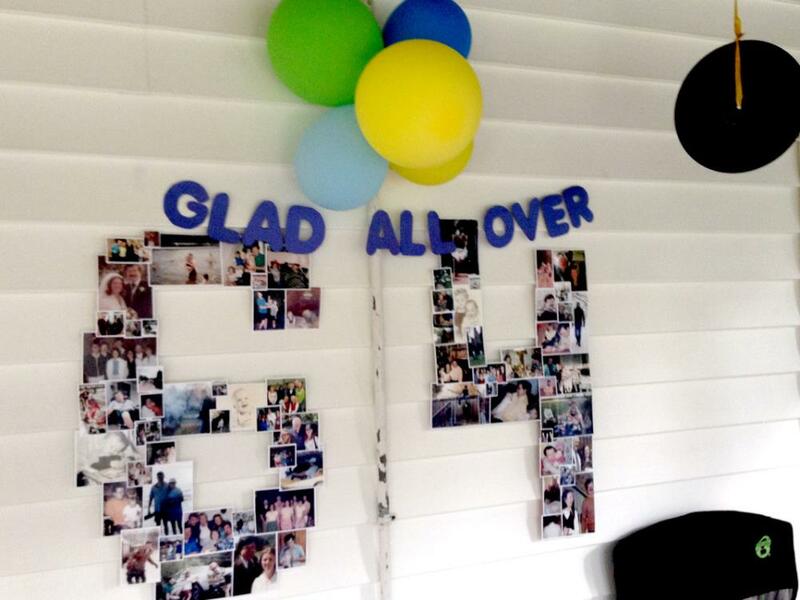 Below is a collage my sister PK made with pictures of my dad through the years, with the song title “Glad All Over” hanging above. 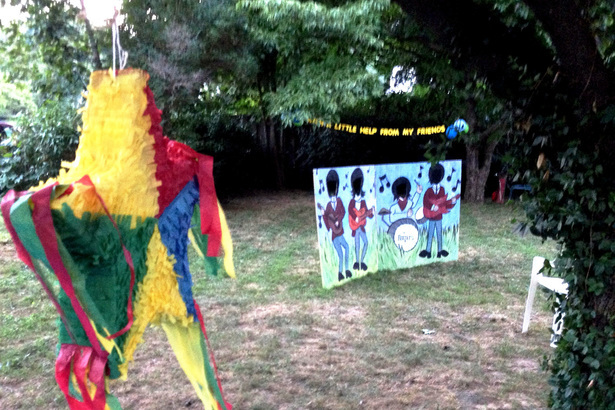 ​Also, for more Beatles party decorations, we used old records hanging from the ceiling. 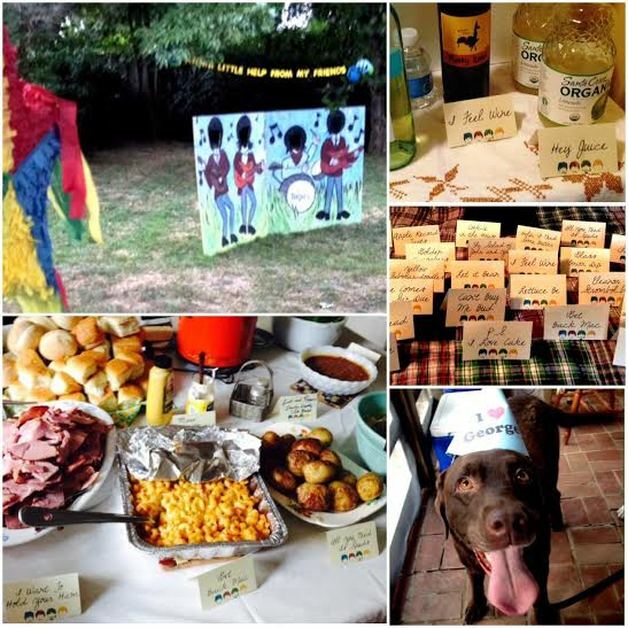 As far as my tasks, I began with the most time-consuming one, which was making the song banners – it was one of the best DIY Beatles party ideas, as it turned out awesome! ​We picked out 20 Beatles songs – mostly Dad’s favorites, and cut out the individual letters so we could make these signs. I used a pack of pre-cut letters from the dollar store, and I traced the letters I needed on yellow and blue paper. I used regular blue construction paper and a thicker yellow paper. Both worked fine. Then I cut each letter out. I used an exacto knife for the holes in the Os, Ds, As, etc. Once completed, I flipped the letters over and hot glued fishing wire to the back so that you couldn’t see the string in the trees. The songs we used were When I’m 64, You Say It’s Your Birthday, All My Loving, All Together Now, Come Together, Eight Days a Week, From Us to You, Glad All Over, Good Day Sunshine, Here Comes the Sun, I Want to Hold Your Hand, Johnny B. Goode, Love Me Do, Ob-La-Di, Ob-La-Da, Twist and Shout, With a Little Help from My Friends, and You’ve Really Got a Hold On Me. 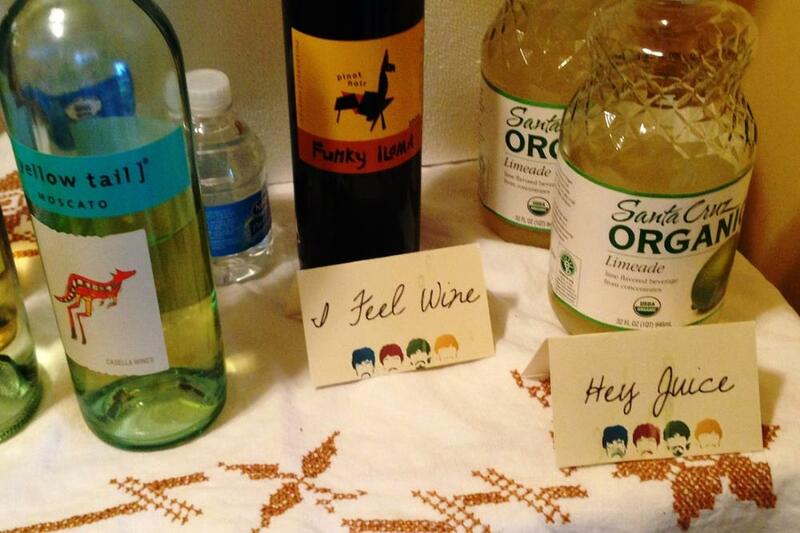 Hands down, my favorite of the DIY Beatles party ideas was creating themed labels for all of the food. 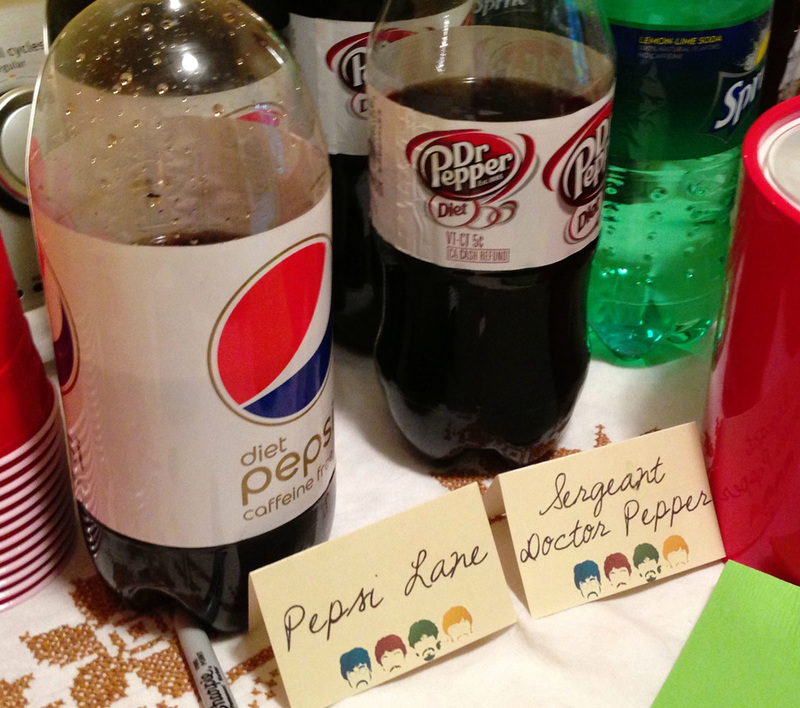 We altered song titles to make a creative label for each food item. My dad helped us come up with the wording – and both of my parents were getting a kick out of how funny we found some of the names. 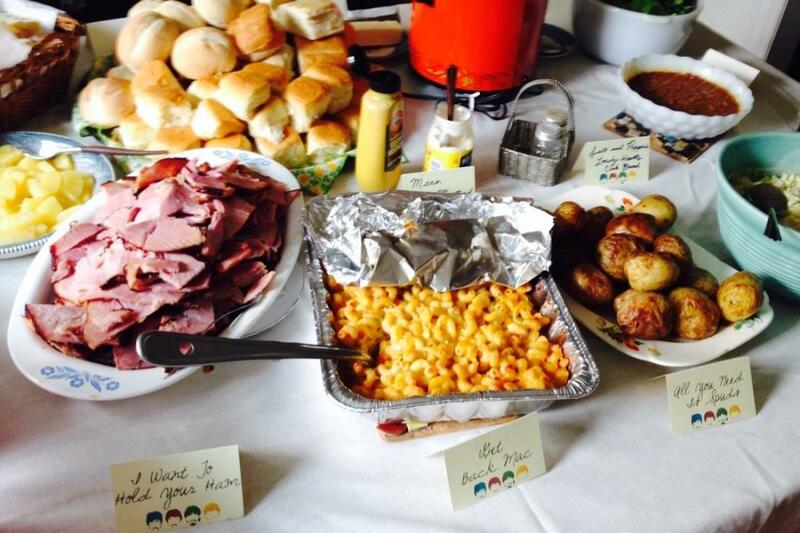 Pictured above are most of the food labels. To make them, I dragged the Beatles picture into Photoshop and then added the name of the dish in a cool font. I love finding awesome fonts. ​You could also use a basic program like Paint to create them too. Hot Sauce – Do You Want To Know a Secret Sauce? 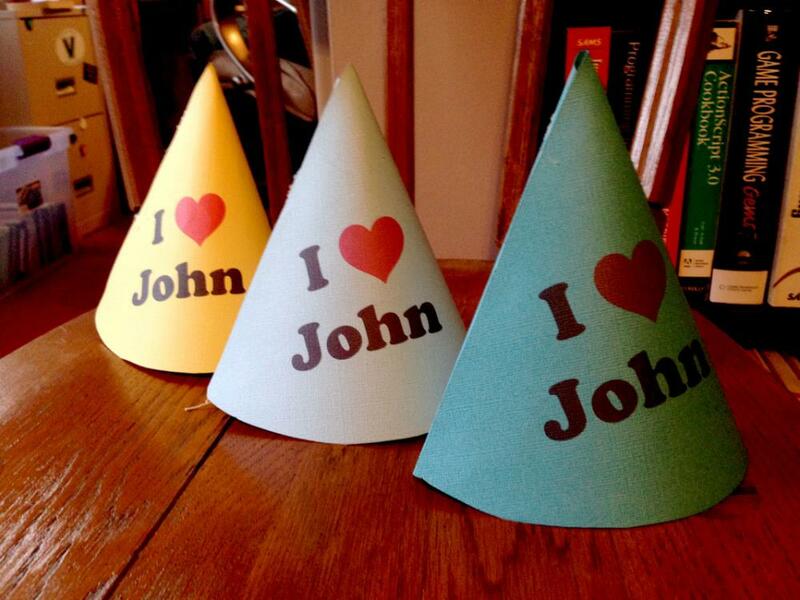 In addition to the other Beatles party decor, I also made these Beatles party hats. I figured they were cheaper to make, and I could personalize them. 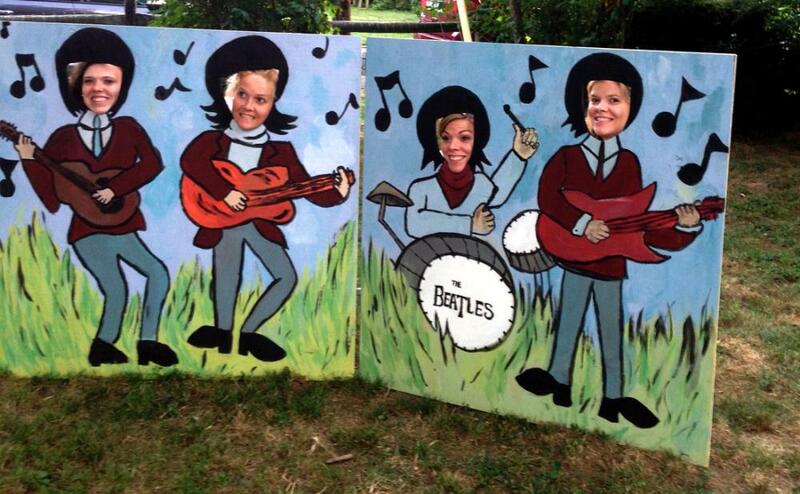 We used the names of the four Beatles – John, Ringo, George, and Paul. My dad’s name is John, which added to the creativity. 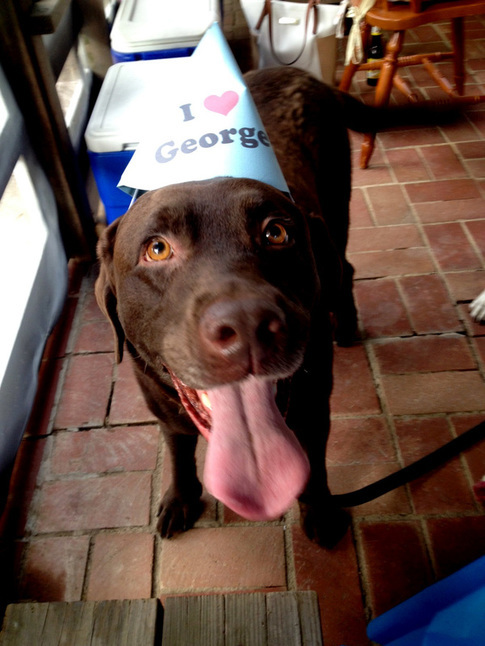 ​We also had a cousin George coming – and he loved his hat shout-out too. ​To make the DIY party hats, I used a free template I found online and purchased scrapbook paper. I did a bunch of test prints (on regular paper) until I got the words lined up right. Then, I printed on the scrapbook paper. After printing, I hot glued elastic (you can get rolls of this at craft stores) to the insides. ​Next, I used our own heads to get a good feel for how long of an elastic to use. Apparently, the hats worked for dogs too. 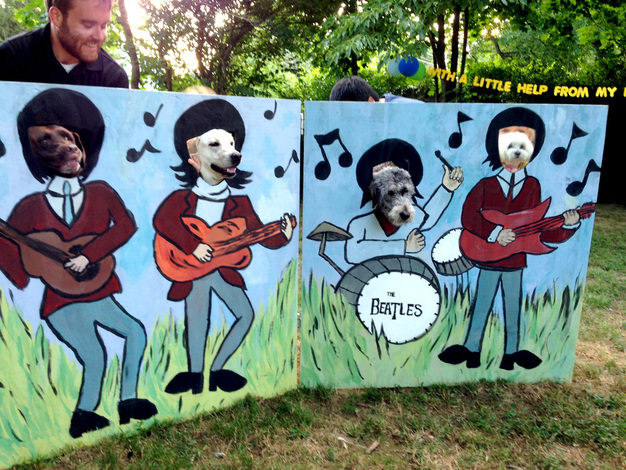 The highlight of the Beatles party was this amazing, almost life-size, face cut-out board of the Beatles, created by my sister Bridget. ​She collected the different paint colors from around the house and garage, and then drew, painted, and outlined. As far as the face cut-out board, we bought a 4×8 from Home Depot and had it cut in half at the store – for the convenience of it fitting in the car and also for the convenience of storage later on. ​Then, we connected the two pieces with hinges. It turned out amazing! So amazing that we had to do a dog pic! 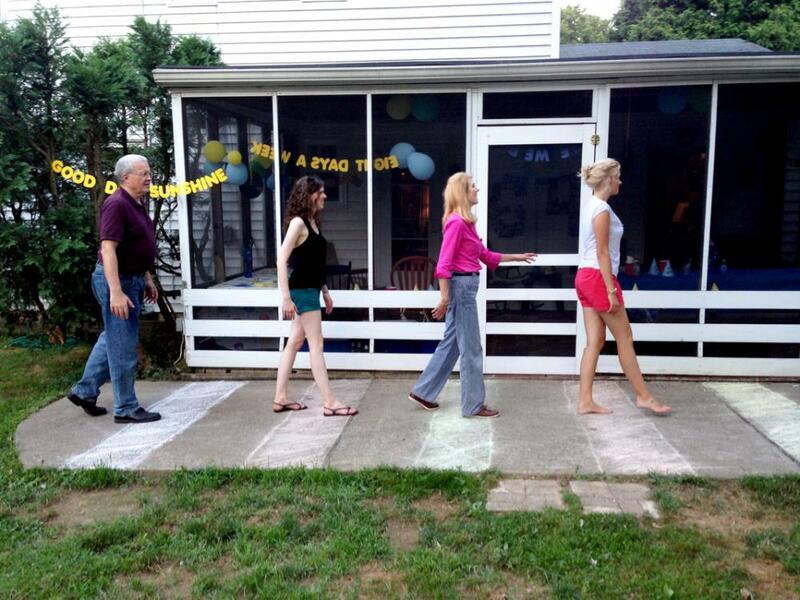 And last but not least, a Beatles party would not be complete without an Abbey Road replication. 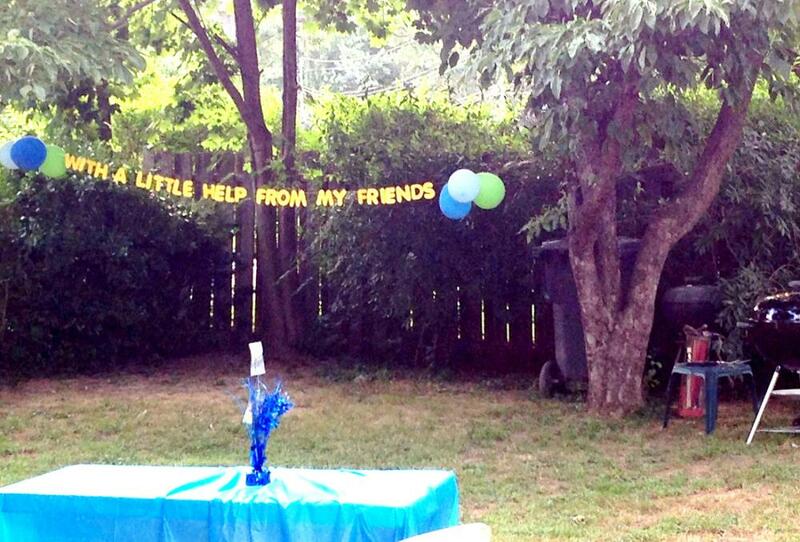 ​We used the patio (and had to use inverse colors –but nonetheless, the point was made) for this fun little scene. 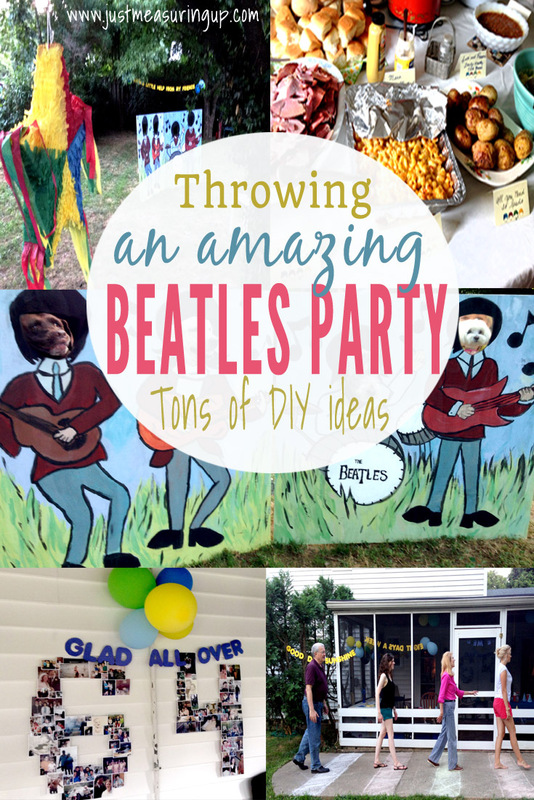 Overall, it was a fantastic party filled with tons of DIY Beatles party ideas! 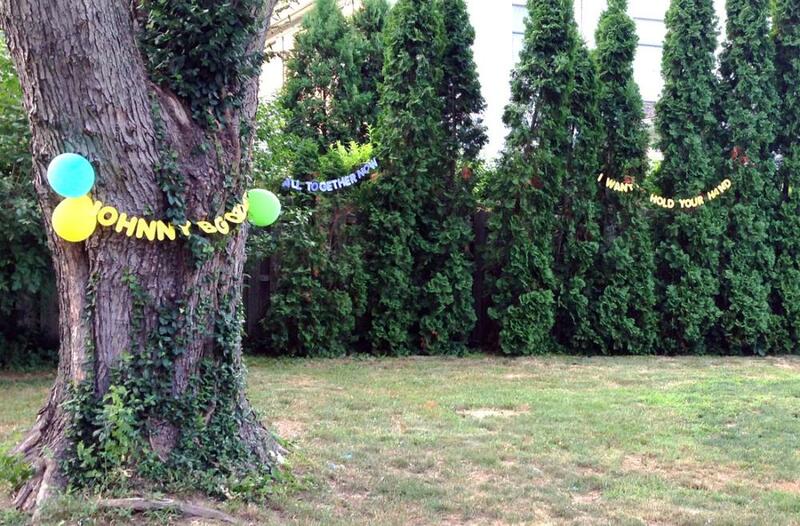 ​My dad had a very happy 64th birthday, our guests loved all the little details of our DIY Beatles party decor, and we had a great time putting everything together for the Beatles party. 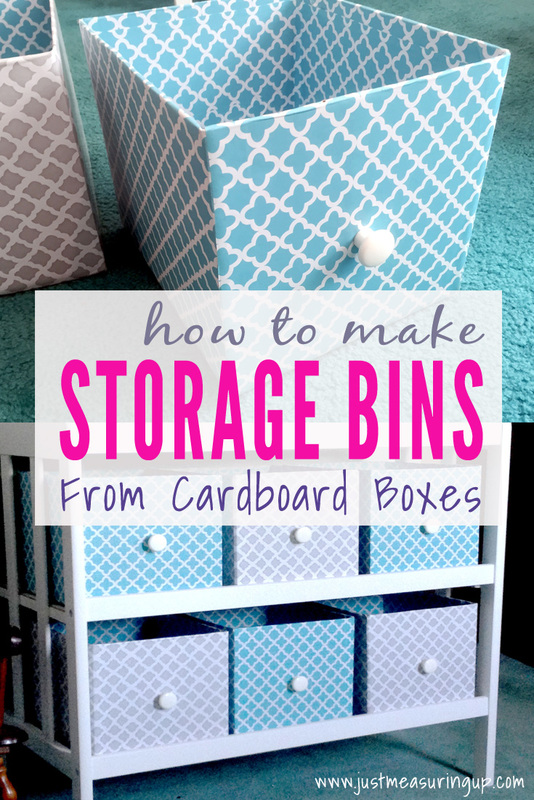 How to Make Storage Bins from Cardboard Boxes Post Preview: Learn how to reuse cardboard boxes for storage. With just a few easy materials, you can make these DIY cube storage boxes that are perfect bins for clothes, toys, or other items. Before our son was born, we found a great changing table with open shelving at a budget-friendly price. I was planning to buy storage bins to fit all the little things you need under the changing table. However, I ran into a snag. I realized that I could only fit two store-bought fabric storage bins on each shelf. It awkwardly left a lot of open space, but three storage bins just didn’t fit across. On top of that, there weren’t many colors to choose from on the store-bought pre-made fabric storage bins. Since I was 7 months pregnant with my first and pretty bored, I decided to make my own DIY storage bins. I tried using fabric from the curtains, but that was a fabric/hot glue mess. 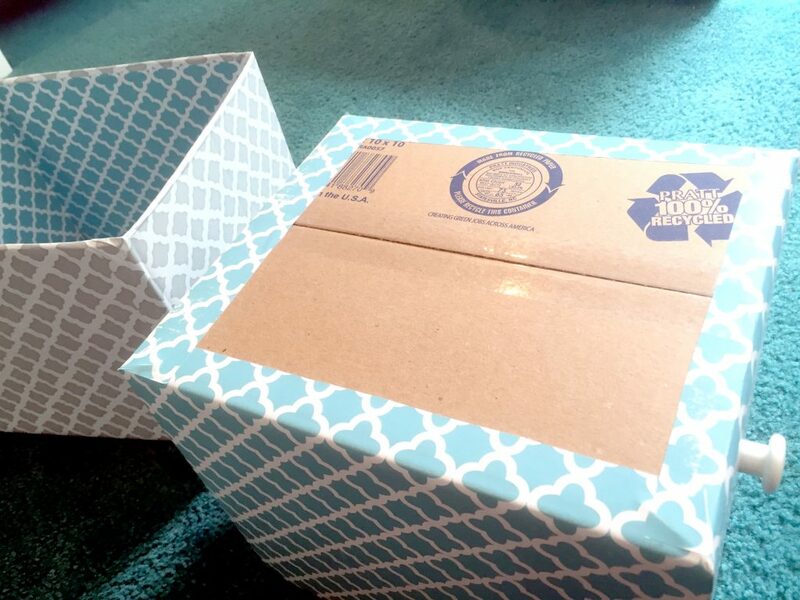 So, I found a much simpler way – making DIY storage bins using contact paper and cardboard boxes! I can’t emphasize how easy it was! Here is the end result – these customized storage boxes are made out of just contact paper, cardboard boxes, and packing tape! Not bad, huh? The contact paper on the DIY storage bins easily allowed me to customize the organizer bins in colors of my choice, rather than being tied to store-bought colored storage bins. I cannot tell you just how much I love these homemade storage bins. The customized storage cubes are so easy to make and you would never know that the base is made from a cardboard box! You just need a little time and patience and a few easy supplies to make these DIY storage bins. You can pick out different colored, patterned, or textured contact paper, which brings character to your space. 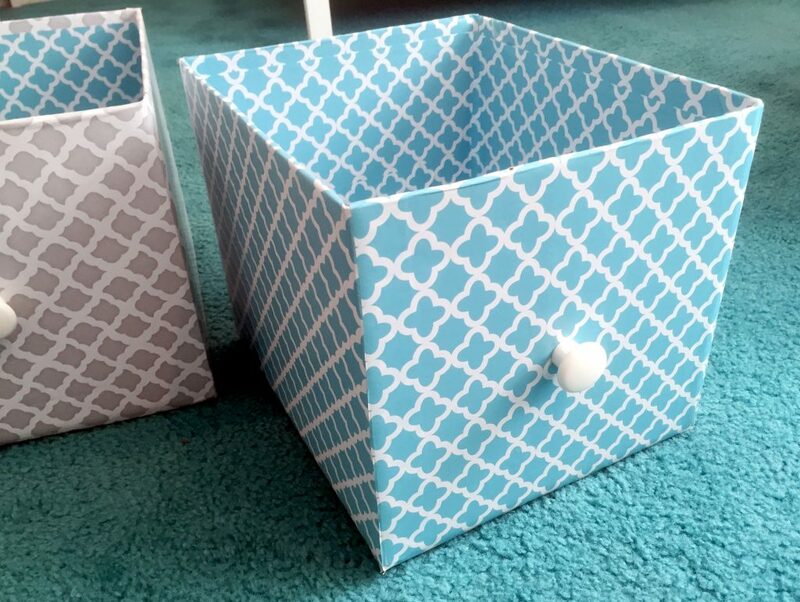 When making your own DIY storage bins, for just a few dollars per box, you get lots of storage and a pattern of your choice. To make these DIY cardboard storage boxes, I ordered a bundle of boxes from Amazon, since we didn’t have any laying around. (Have I mentioned how much I love Amazon prime?!) We were planning to move soon, so we would use the rest of the cardboard boxes then. However, if you have little ones already, diaper boxes and wipes boxes work really well for these cardboard storage boxes. I also ordered three types of contact paper for the storage bins. 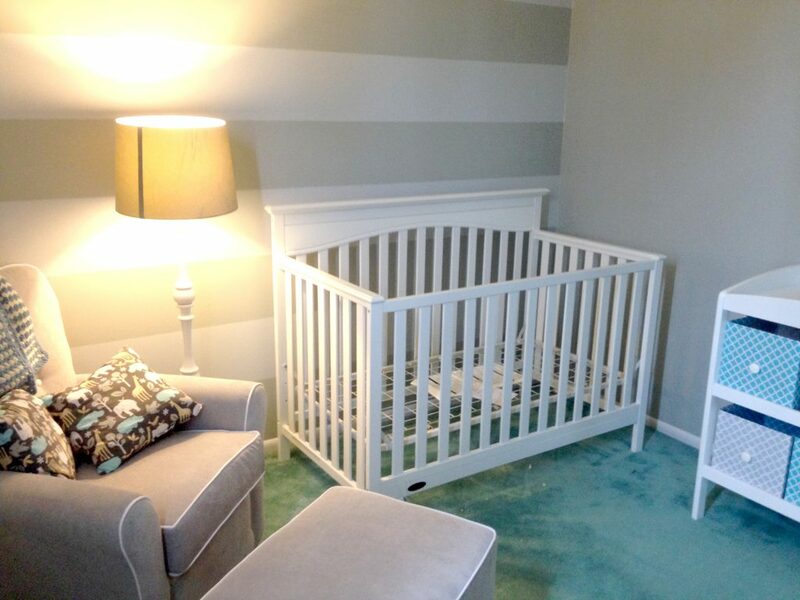 The baby’s room was going to be gray and turquoise (gray walls, one striped with a lighter gray, turquoise carpet, and white furniture – check out our nursery makeover). So, I found a cute, high-quality turquoise patterned paper and a gray one on Amazon. I figured I would alternate colors on the customized storage boxes. For the inside, I used a less expensive, thinner paper in a neural color from Target. You don’t have to cover the inside, but it is nice to have a storage bin where you can easily wipe the inside. To make DIY storage bins, first measure the area where you want to put your customized boxes. Make sure they will fit length, width, and height-wise. I had to cut a little bit off the top of my cardboard boxes to make them fit. Next, cut the flaps off of the cardboard boxes. You could use these as dividers, if you’d like 🙂 Use a good pair of scissors or a box cutter if you are cutting your cardboard box. Now you are ready to cover your DIY storage bin with contact paper. Cover the outer four sides of the cardboard box with contact paper. Pay attention to patterns, if you want everything lined up nicely. Some patterns are easier to work with than others. I didn’t cover the bottom of the cardboard box with contact paper, so this is what the bottom of the homemade storage bin looks like. Also, you might need to tape the bottom or inside edges of the contact paper down, depending on the quality of your paper. If you want your customized storage boxes to last, I would get good quality paper, like this one. Next, if you plan to cover the inside of your DIY storage box with contact paper, you can do that now. Since I was making this batch of customized storage bins for my son’s nursery, I wanted the inside of the box to be nicely covered, so I could easily clean it. Later on, I made more cardboard storage boxes for various things, like paper storage, and I didn’t cover the insides – so it’s up to you! Now, ready for the best part? This really makes your DIY storage bins look store-bought and makes them super functional. After I was finished covering the inside and outside of the customized boxes, I was ready to add the knob to the cardboard storage box. The knobs made the storage bins look professionally made and made the bins easy to quickly grab. I picked the knobs up from Home Depot – they were inexpensive white knobs. 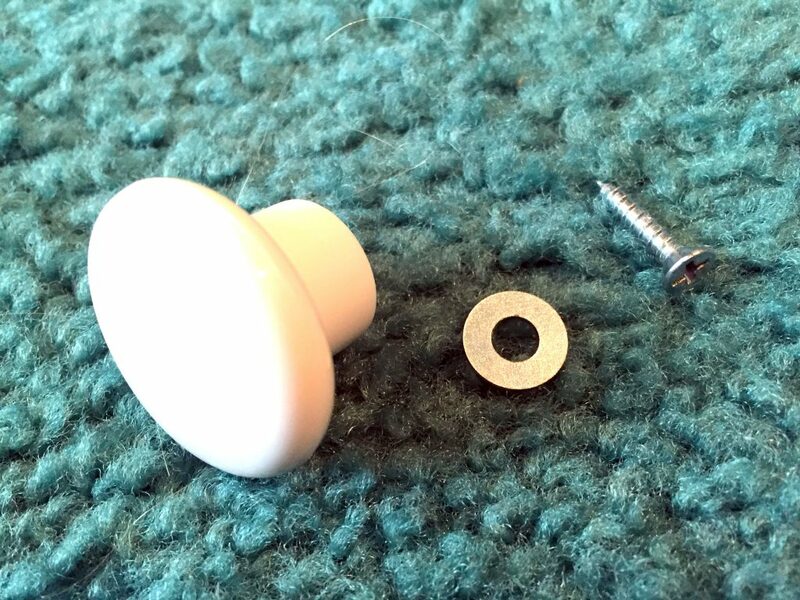 Yet, the screw was too long – so I simply swapped the large screws out for the short ones. 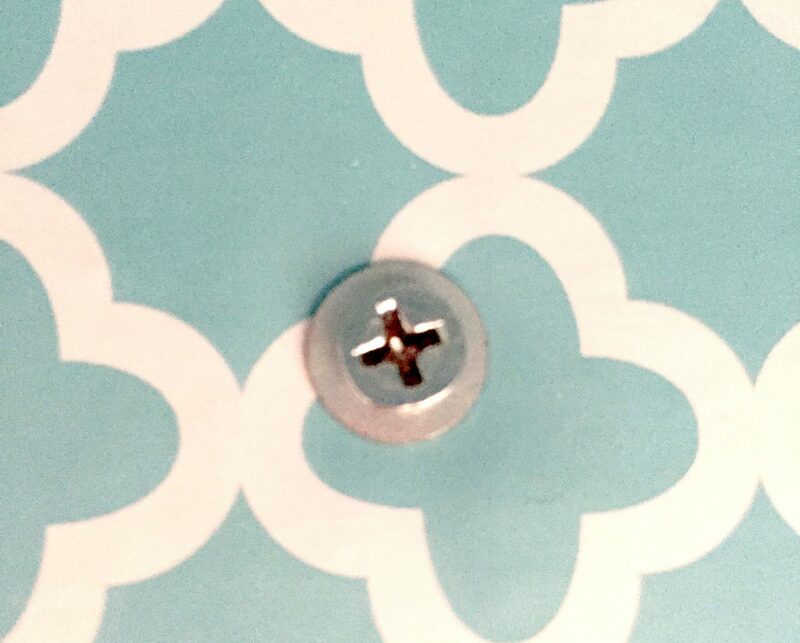 (Below is the knob, washer, and short screw). I drilled one hole in the front of each DIY storage box. 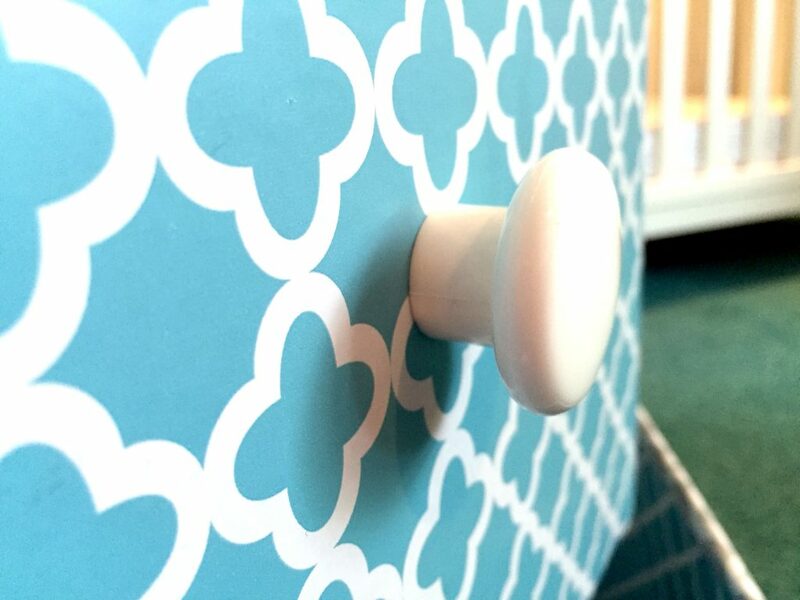 Then, I added simple, white knobs, so I could easily pull customized bins in and out. Here’s a picture of what the inside of the DIY storage box looked like, after adding the knob. I definitely recommend using these knobs for the cardboard storage boxes because they made it so easy to pull out each homemade storage bin. Later, I made more customized storage bins – for closet storage (winter hats, gloves, etc) and for Ash’s office. I used knobs on all of them and it was so much easier to grab a knob from the top shelf of a closet, then a whole bin. For less than $5 per box, I had functional customized storage bins that I LOVED. The total cost of making customized storage boxes is really just the amount you spend on contact paper and knobs. I made my storage boxes for less than $5 per box. I was so pleased with cardboard storage boxes that I used the leftover materials for winter storage bins and pantry floor bins. I also used chalkboard contact paper to make paper storage boxes for Ash’s messy office closet. They were fun because you can write on the contact paper with chalk, which makes for easy labeling. These DIY storage bins are so pretty that you can put them anywhere in your house, leaving your guests wondering just how you made storage bins from cardboard boxes. Overall, this was one of my favorite thrifty DIY projects – it’s hard to believe that underneath the customized storage bins is a simple cardboard box. Updated: How did the storage bins hold up? The customized storage bins have held up great. Four years later, these nursery storage bins still are in tact. In fact, I just tightened the knobs yesterday for the first time. The contact paper has remained on perfectly too. And, I should mention, these bins get a lot of use! Four years of pulling the diaper bins out multiple times per day!